CHICAGO — Semyon Varlamov was busy all night, but he was thankful his teammates made sure he could see the puck. Nathan MacKinnon scored and set up a goal by Maxime Talbot in the opening 1:17, Varlamov finished with 54 saves for his third shutout of the season and the Colorado Avalanche beat the Chicago Blackhawks 2-0 on Tuesday night. Colorado was outshot by 30 but held on for its third win in four games behind Varlamov’s 16th career shutout. The Avalanche improved to 7-3-2 in their last 12 as they avoided screening their goalie and quickly cleared loose pucks. 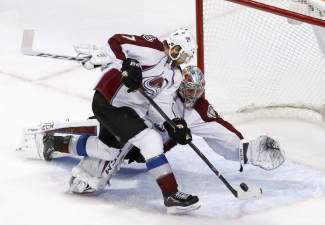 “The good thing is, the guys weren’t staying in front of me,” Varlamov said. “They were giving me a chance to see the puck all the time. That was key. Varlamov has three straight wins against Chicago and has won four of his last five games against the Blackhawks. In the four wins, he’s allowed just five goals. MacKinnon, who won the Calder Trophy last season as the NHL’s rookie of the year, scored 53 seconds into the game with just his second goal in his last 22 games. He had 24 goals and 39 assists in 2013-14 as an 18-year-old, but has just seven goals and 17 assists this season. Corey Crawford finished with 22 saves for the Blackhawks, who had a season high in shots and dominated the pace as the game progressed. However, Chicago was blanked for the third time this season. The Blackhawks have given up the first goal in five straight games, and they admit poor starts have become an issue. After defenseman Johnny Oduya fell down, John Mitchell sent MacKinnon in alone and he opened the scoring on a rising shot. Colorado made it 2-0 just 24 seconds later as MacKinnon got past Niklas Hjalmarsson and broke in alone on Crawford again. He skated to edge of the crease and slipped a short pass to Talbot, who buried a shot from only a few feet out. The Blackhawks picked up their pace midway through the period and outshot the Avalanche 17-11 for the period. Chicago dictated the play for most of the scoreless second, outshooting Colorado 20-5, but the Blackhawks had limited close-in, screened and rebound attempts. Chicago’s best chance came 5:40 into the period during a power play when Varlamov stopped Bryan Bickell on a rebound of Brad Richards’ shot from the blue line. Chicago’s Brandon Saad hit the post with a shot 10 seconds into the third. The Blackhawks had the puck for most of the period, but Varlamov continued to stop initial shots and Avalanche cleared loose pucks. Saad poked a rebound under Varlamov with 2:17 left in the third, but the goal was disallowed because the whistle had blown. NOTES: Blackhawks F Kris Versteeg missed his second game with a left hand injury that’s expected to keep him out a month. According to a statement from team physician, Dr. Michael Terry, “Versteeg underwent a procedure today to further stabilize a metacarpal fracture in his left hand. We do not anticipate any significant changes in his return to play timetable and we continue to anticipate a full recovery.” … F Daniel Carcillo was a healthy scratch for the second straight game after not recording a point in his previous eight. “His pace hasn’t been the same as it was most of the year,” Quenneville said. … D Tim Erixon also was a healthy scratch. … Colorado D Zach Redmond was a healthy scratch after skating in the warmups.